Contact Form – If you contact me via my contact form, this service will collect your name and email address so that I can respond to you. It does not collect any other personal information. MiloTree – this mobile service is used to collect your name and email address for the delivery of email updates and newsletters. We store your name and email address for purposes of delivering such communications. Users may see your username, email address, avatar, profile description and website information. Little Red Window (Little Red Window Design) is a participant in the Amazon Services LLC Associates Program, an affiliate advertising program designed to provide a means for sites to earn advertising fees by advertising and links to Amazon.com. As part of this Amazon Associates program, the Website will post customized links, provided by Amazon, to track the referrals to their website. This program utilizes cookies to track visits for the purposes of assigning commission on these sales. Our website may contain other affiliate marketing links, including Craftsy and ShareASale, or Skimlinks, which means we may get paid commission on sales of those products or services we write about. There is NO additional cost to you. Our editorial content is not influenced by advertisers or affiliate partnerships. This disclosure is provided in accordance with the Federal Trade Commission’s 16 CFR § 255.5: Guides Concerning the Use of Endorsements and Testimonials in Advertising. Opt-out – You may opt-out of future email communications by following the unsubscribe links in our emails. 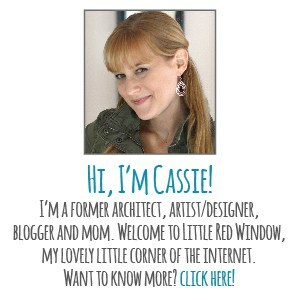 You may also notify us at cassie@littleredwindow.com to be removed from our mailing list. Access – You may access the personal information we have about you by submitting a request to cassie@littleredwindow.com. Amend – You may contact us at cassie@littleredwindow.com to amend or update your personal information. Forget – In certain situations, you may request that we erase or forget your personal data. To do so, please submit a request to cassie@littleredwindow.com. The Website does not knowingly collect any personally identifiable information from children under the age of 16. If a parent or guardian believes that the Website has personally identifiable information of a child under the age of 16 in its database, please contact us immediately at cassie@littleredwindow.com and we will use our best efforts to promptly remove such information from our records. I will never sell your information to any third parties when you sign up for my newsletter, comment or otherwise contact me! This site does contain links to other third party sites. I am not responsible for their privacy practices, please be careful with your personal information. I reserve the right to change, modify or update this policy at any time. Questions? Please let me know (cassie@littleredwindow.com)! Can I share one of your posts? Yes, please do share my work! You may share one or two of my images as long as you provide a proper link back to the original post. Please do not crop out watermarks, post any written steps or use more than one photo of tutorial steps. If you share one of my posts on social media, don’t forget to tag me! I thought you said this knitting pattern was free? Why is it taking me to your etsy shop to pay? Go back to the pattern page and #1: actually read the post and #2: keep scrolling down… yep, keep going…past the pdf printable button…yep, there it is! The entire pattern IS available for free. And look! There are even step by step photos! Now if you prefer a convenient one-page (or two pages in a few cases) printable version or want some additional size options, you can upgrade to the PDF version for a few dollars. That little bit of money helps me keep my site running and I soooo appreciate it. But it certainly isn’t mandatory. How do I print one of your free knitting patterns? You can just hit print on the website, but it will probably be several pages long. If you want the convenience of a one page printable version (+ additional size options) for just a few dollars, visit my Etsy shop. As I said, those few bucks help me keep my site running and help me keep bringing you adorable patterns! Can I take your post and repost an excerpt or the entire thing on my site? No. Seriously. I have lawyer friends. littleredwindow.com is copyrighted and cannot be copied and reproduced (either in print or electronic form) without my prior written consent. Can I make one of your projects/ideas but repost it on my own site with my own words and pictures? You can, but that isn’t very nice. Can I make something “inspired by” one of your projects/ideas and post it on my site? How do I print one of your free printables? Click on the link within the post and a pdf will open in a new tab in your browser. Print the pdf from there to your home printer (I recommend cardstock). The print will print on 8 1/2″ x 11″ paper so you will have to trim your print down to 8″ x 10″ with a craft knife or scissors to fit in a standard frame. Can I distribute, sell, or post one of your free printables? Free printables are copyright Little Red Window Design and are intended for personal use only. You may not distribute, sell, reproduce (in print or electronically), or post them online. You also may not use any of the art or designs from the free printables in other works of art, printed materials, as clip art, or on other websites. If you’re interested in sharing one of my free printables you may share the one featured low-res image from the post (with watermark) and include a link back to the original full post for people to print their own copy.